Holestone Young Farmers’ Club have had a very busy year celebrating their 75th anniversary. 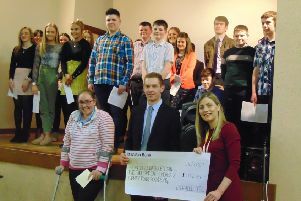 This year Holestone YFC has chosen Air Ambulance NI as their anniversary charity therefore any money raised throughout the year will be going to this chosen charity. In September the club decided to embrace the young farmer’s theme (embracing change) by raising money on a seven seater bike around Co Antrim. The bike travelled 75 kilometres for 75 years of Holestone YFC. The bike run consisted of past and present members. Furthermore, in November Holestone YFC held a Night at the Races in the Five Corners Guest Inn, Ballyclare. A great night was had by all attendees including the winners. Currently Holestone YFC members and producers are working hard practising for their arts festival which will be performed in Ballymoney High School on Friday, February 15. Holestone YFC would like to welcome everyone to their 75th anniversary dinner which is being held in the Ross Park Hotel, Ballymena on Saturday, March 2. Tickets are now on sale, £30 a ticket (first come first served), past and present members are welcome. The guest speaker on the night will be YFCU president James Speers. All money raised on the night is in aid of Air Ambulance NI. For tickets please contact Laura Patterson on 07590227380 or email holestoneyoungfarmers_coantrim@hotmail.com.